The Chronicles of Thomas Covenant, Unbeliever (first and second) were a pivotal moment in my early fantasy reading. They were grown-up fantasy, full of moral quandaries and difficult emotions, but they were also stunning works of imagination, populated by brilliant characters. Even when he was writing gothic romance and portal fantasy with Mordant's Need, or sweeping science fiction with The Gap Cycle, Stephen R. Donaldson's work was always marked by those elements - stunning imagination and brilliant characters. Sadly, that's precisely why Seventh Decimate falls so short. The first book of The Great God's War reads like a self-indulgent short story, big on ideas, but short on everything else. It's a heavy-handed morality tale about the horrors of war and the stupidity of racism/nationalism, couched in a thinly-veiled desert fantasy. For a man who excels as world-building, this falls so short, it's really quite embarrassing. We get two warring countries, separated by a river . . . or chasm . . . or cliff . . . or something that's never really clear. There is an ocean to one side of them and a desert to the other, both assumed to be impassable - although it turns out the desert is simply a challenge, and hardly an insurmountable one. If there is anything else to the world (and we do get hints later in the story), neither country has the slightest idea. Similarly, for a man whose fiction is defined by its characters, this falls even shorter than it did in the world-building. There is hardly a likeable character in the book, and none of them have any more depth than a background character. Most importantly, Prince Bifalt, the protagonist of the story, is even more unlikable than Thomas Covenant - a miserable, leprous man who most readers remember for a single unconscionable act. The Prince is a bland, boring, arrogant young man with a single-minded obsession. If only he had demonstrated a sliver of growth, this could have been a far better story, but if that growth is in the cards, it's not in this volume. Finally, that brings us to the plot, which is the only thing weaker than the world-building and the characters. It is largely a paint-by-numbers story, predictable in every way, with a conclusion so foregone it should just be dropped into the cover blurb. Aside from the opening battle and the scenes involving the mysterious desert caravan of nations, there is nothing here of interest or excitement. There were moments of potential, where the story could have opened up, but it lacks the characters necessary to do so. 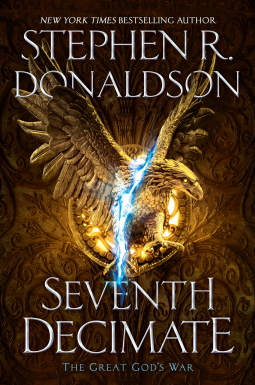 I had high hopes for Seventh Decimate, especially after The King's Justice proved to be such a fantastic read last year, but was bitterly disappointed. Unless the digital ARC was a rough draft that was accidentally released, I don't see myself continuing with this. 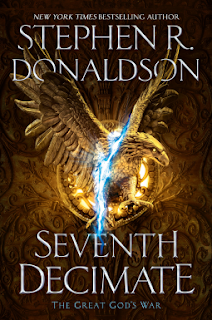 Donaldson is one of my favorite fantasy authors. Sadly, I've learned everyone can have a dud or three.